Move over, Pinot Noir. Périgord black truffles have arrived. That’s right. Truffles have arrived in Sonoma County, California, and they may just steal the Pinot Noir spotlight as Sonoma’s most dynamic crop! Granted, that won’t happen tomorrow as it takes truffles seven to ten years to produce a proper, top-quality crop. (In comparison, wine grapes are seemingly gracious in needing only three to four years to do so.) 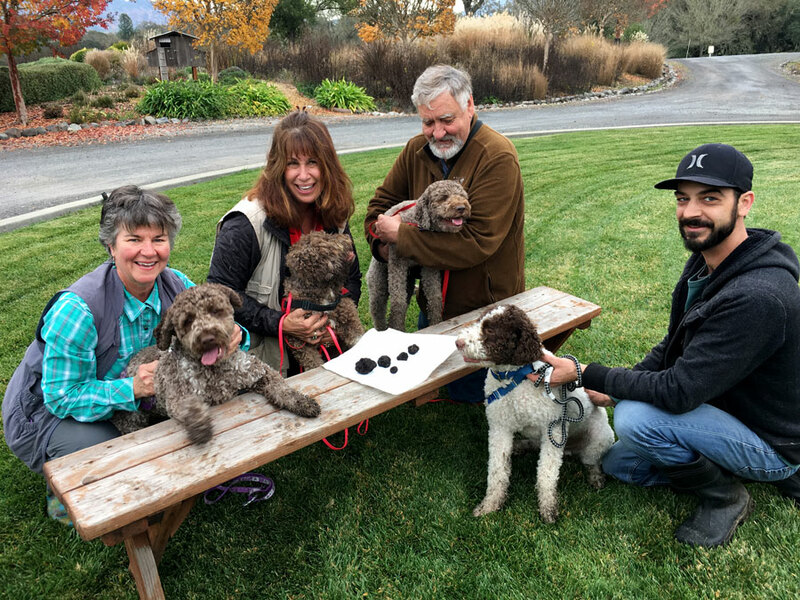 The Jackson family produced its first truffle crop in the fall of 2017 (following on Jess Jackson’s 2009 vision to begin such an operation), and its journey has only just begun. Let’s return to the reality of “farming” or, as the Jackson family likes to say, “gardening” of truffles. The economics are astonishing. Fully functional truffle “orchards” can generate an average of 70 pounds per acre. At an average selling price of $900 a pound (granted, the prices vary widely), that’s a $63,000 pop per acre. At a few tons per acre, Pinot Noir might yield $18,000, were the grapes to be sold off. With truffles, you sell them off as fast as dogs sniff them out and purveyors can race them to the nearest and best market tables. With Pinot Noir, if you’re not selling off the grapes, you have to process, blend and age the wine for 12-24 months in pricey new French oak. Then, you have to go sell it. So, the realities – and profitability – of growing and selling these two products become blatantly clear very quickly. Nonetheless, Jackson Family Estates Orchard Manager Brian Malone insisted that the potential success of truffle growing is far from clear. “There’s no silver bullet. Like any other crop, the truffles produce different results in different sites.” Terroir impacts truffles just like it does wine grapes. Also, in more established truffle orchards harvests can vacillate between bumper crops and next-to-nothing. But, we’re not talking truffles to dissect numbers. We’re ready to indulge in deliciousness! So, let’s get to the heart of that matter. A truffle is a fungus (a bit like a mushroom) grown underground. It looks like a knobby potato, and it’s stinky, too. At least it stinks good! In fact, unlike wine grapes that ache for the sun, truffles like the shade of trees, even when they are already growing in the earth. Yet very much like wine grapes, especially the grapes that pair well with truffles – such as Chardonnay and Pinot Noir, truffles grow best in calcareous soils. Surprisingly, of the hundreds of types of truffles, fewer than ten are used for cooking. Malone said that most of truffles harvested at the Jackson family's truffle orchard in 2017 ranged between the size of a silver dollar and a racquetball, save one that might be a USA record-breaker the size of a softball and that weighed almost 13 ounces! WHAT IS A BLACK TRUFFLE? Black truffles, or Tuber melanosporum, are sturdier than white truffles. They can stand the heat of cooking, so they are more versatile in the kitchen. They seem to have originated from France’s Périgord region (hence the name Périgord Black Truffle), tucked away inland to the northeast of Bordeaux and west of Lyon. When people talk about French truffles, they’re talking about black truffles. 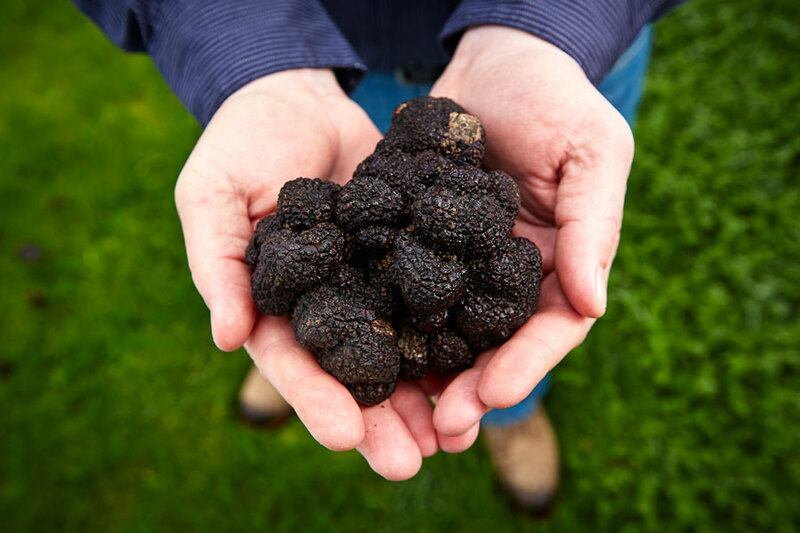 When foodies talk about summer truffles or black summer truffles, they are also talking about French truffles – or at least Périgord black truffles. Call name: Black Gold. WHAT IS A WHITE TRUFFLE? If you’re a truffle geek, you might refer to white truffles as Tuber magnatum. These truffles are more precious as they wilt under heat. They tend to be shaved over dishes when they are ready to be served, often with one of those nifty microplanes. These tend to be revered as the most expensive species of truffle. While mushrooms and truffles are part of the fungi family, they are far from the same thing. From their feel and cooking methods to their price points, truffles operate at the edges of familiarity. Mushrooms grow above ground; truffles thrive below the surface. Mushrooms tend to exhibit mild flavors; truffles belt out the depth of theirs like an opera singer on the stage at Carnegie Hall. Accordingly to Malone, truffles can be found from a few to ten inches into the ground. Classically, pigs and dogs hunt truffles (with their humans in tow.) Today, dogs are preferred as they find but don’t swiftly devour the tasty fungi before their owners can pick them up. Yet in the absence of either or in order to more quickly haul in truffles – whether or not they are optimally ripe, truffles can be raked. Just like hand-picked grapes, the higher quality of hunted truffles shoots up their prices. Hunted truffles can be 15 to 20 to far many more times expensive than raked truffles. This is because hunted truffles tend to show peak-of-ripeness flavors while raked truffles include ripe as well as under- and over-ripe bulbs. Harvesting with dogs has one primary drawback: those adorable tail-waggers fatigue after a few hours hours. Noses can get roughed up being glued against the ground for hours, it can be cold out, and at some point pups can just lose interest in what they consider to be a game. Malone thinks it would take two to three days to properly cover the current, approximately 10-acre Jackson Family Estate truffle orchard, and the orchard could require many passes over weeks or months to optimize its harvest potential. In fact, Malone is thinking of adopting his own dog and training it to hunt truffles to better understand the potential of the orchards he planted. Truffles harvested at peak ripeness have rather fragile aromas. White truffles – again, the most expensive – are notoriously the most elusive. Their aromas linger only about a week. Once unearthed, it’s a race against the clock. The faster you can use your truffles, the more engaging their flavors will be. Black truffles can – according to some – be frozen and thawed successfully. Still, Malone said the chefs in the Kendall-Jackson kitchen were blown away by the expressiveness of just-harvested truffles – literally pulled out of the ground that day – versus truffles that had been harvested a few days ago in Europe that were then flown to California. In the Northern Hemisphere, white truffles generally are harvested between September and December. Depending on the black truffle, the harvest season might pick up at the end of the white truffle season, around December, and might extend into summer. Differently from vineyards, where blocks of vines grown for dry wines tend to ripen at the same time, truffles ripen at their own pace. So, truffle harvesting is more like picking grapes for sweet wines, where it is typical for a crew to pass through the vineyard several times to pick grapes at their particular ripeness peaks for a certain style of wine. You bet. Wine grapes and truffles tend to grow well in similar areas. Both like homes where there are no weather extremes of heat or cold. Additionally, both agricultural products need just enough nutrients and a soil that retains some water but not too much. The criteria are pretty specific! But, there’s little worry that your favorite Kendall-Jackson Jackson Estate single vineyard will be ripped up and replaced with a truffle orchard. Truffles are perfectly content to co-habitate with grape vines. In fact, it seems as though they would be highly successful in frost-prone or shady - even perimeter - parts, of a property that might struggle when planted to vines. Speaking of shade and co-habitation, truffles grow with trees. Hence the talk of “truffle orchards.” Specifically, they grow on the roots of trees. The Périgord black truffle likes hazelnuts and oaks. The trees planted for the Jackson Family orchard (in a ratio of 4:1 of hazelnuts to oaks) were each injected with the truffle fungus prior to planting. Truffles cannot synthesize carbohydrates to thrive, so the trees do that. In return, the truffles gather nutrients for the trees with their growing web of filaments. In their youth, the trees grow better with the help of truffles. Additionally, truffle enthusiasts elaborate like wine buffs on the characteristics that differentiate Oregon versus Italian versus Australian, etc. truffles. 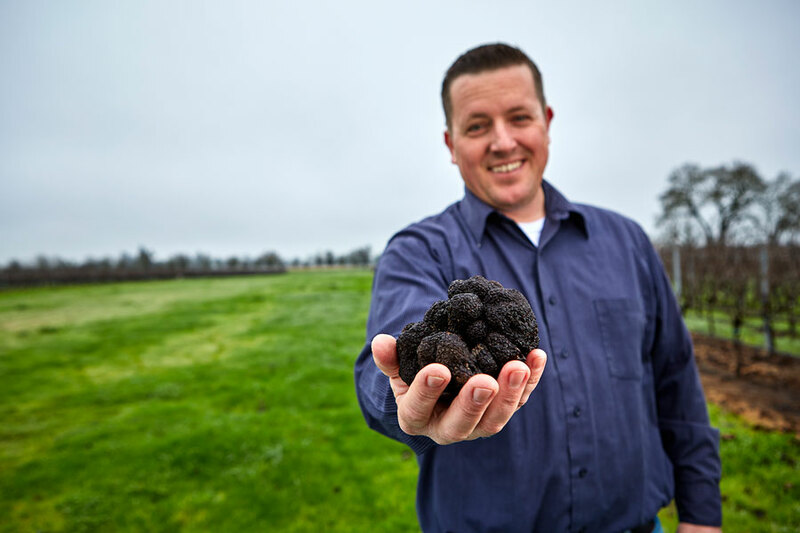 How about the Tuber melanosporum grown in Sonoma? Malone said they have a sweet yet earthy tone to them and marveled how their pungent smell actually “infuses the soil” around the truffle. Amazingly, he said you can put your nose to the ground where a pup has sniffed out a truffle and you can smell the truffle through the dirt! HOW DO YOU PAIR TRUFFLES WITH WINE? Interestingly, the dynamic and exotic taste of truffles pairs well with subtle and simple food ingredients. Eggs, rice (à la risotto) and pasta are some of its best pairing buddies. You don’t really even cook truffles. You just need to accompany them with a warm enough “base” food to encourage the truffles to “blossom” into its accompaniments. Malone loves scrambled eggs topped with Parmigiano Reggiano and shaved Périgord black truffles served with one of the Kendall-Jackson Jackson Estate Pinot Noirs. So, while this piece started by sounding an alarm that truffles might take over the vineyards and wines of Sonoma, it turns out that the two should co-exist well. Indeed, truffles’ best wine pairings tend to be as high-end as they are. Pinot Noir and Chardonnay are two of this fungus’ ultimate pairing partners, which can’t help but make sense given Sonoma’s (and the rest of western California’s) grape growing environments. As the Italians say, what grows together goes together. Indeed. A tavola… dinner time! P.S. Kendall-Jackson Wine Estate & Gardens will be hosting truffle-tasting dinners with its first harvest of home-grown truffles very soon. Stay tuned!